Today was pretty much the polar opposite of yesterday. This stretch from Mt Robson is not done by a lot of GDTers because of what we did today. If you don’t do the high routes and it rains, there can be a lot of overgrown boggy hiking in this section. Yep, that’s what we got today. The good news for today was that it didn’t rain! The reality was that we still wore our full rain gear most of the day because the wall of brush we went through was still wet. The morning was cold and damp from rain last night. E said she had ice on her tent as we were packing up. We still had a couple miles to go downhill along the Jackpine Mtn trail to reconnect with the GDT along the Jackpine River. As we headed down, we lost the trail in a meadow…an event that would soon become routine today. 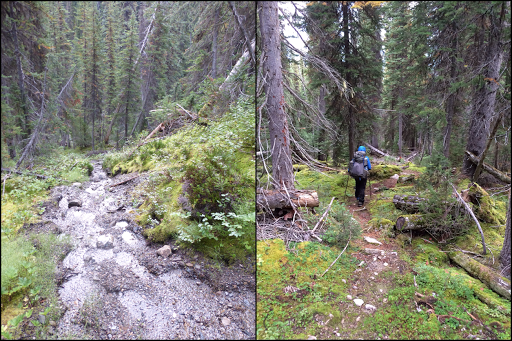 We spent a good 30mins bushwhacking horizontally from one drainage to the next trying to figure out which one the trail follows down. 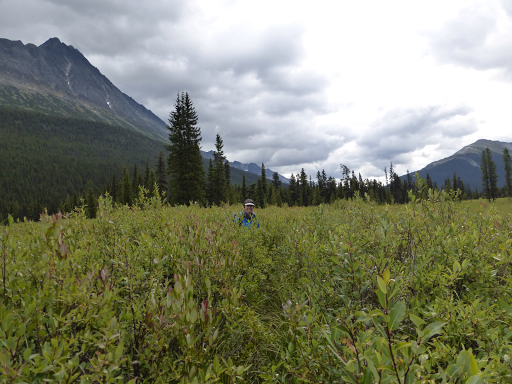 We initially thought we might have been on the wrong trail to begin with, but as would be the routine today, it was just that the trail completely vanishes in meadows and we were in the right place the first time. Eventually, we figured it out. We were good and wet after going through wet brush and muddy trail to get down, but that didn’t matter because we had a full day ahead of it along the Jackpine River. 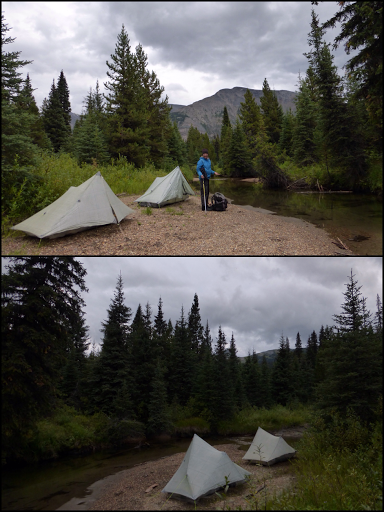 Almost the whole day was spent finding and then losing trail along the Jackpine. It was easy to know where we needed to go because we just needed to follow the river, but it was completely covered in willow brush and made for slow going. We did see our second moose of the trip when we first got down there, but it was at a distance and it walked into the woods before either of us could react to take a photo. The hiking itself wasn’t too intensive, but it was mentally taxing to be in such resistance all day. Some of it was so thick it would bounce you back off itself. We had trail off and on. Sometimes right along the bank of the river, sometimes we’d have to cross (6 fords), other times we’d walk in the river along the bank if trail washed out. We are definitely benefitting from a low snow year and low rivers. 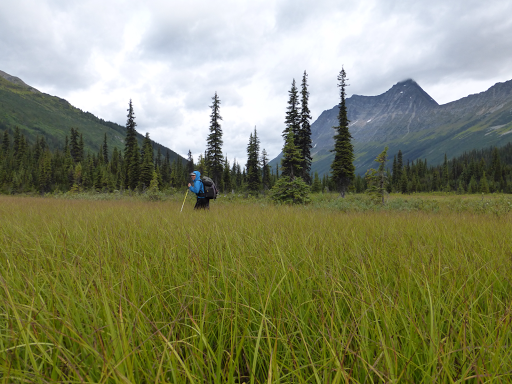 The worst part was the deep meadows of muck in deep grass or willows. It just sucked your feet into the brown muck deep into the brush and you didn’t know how far you’d sink each step. No trail at all in those boggy meadows, and we’d just guess on where it would be next sometimes having to bushwhack through forest to get back to the the trail hopefully along the river…and when I say trail, I mean a deep muddy ditch that weaves into wet willows at least chest high. Yep, good times. We did get lucky and finally find some good trail after an hour or two on the east side a couple miles before Castor Creek flowed in. 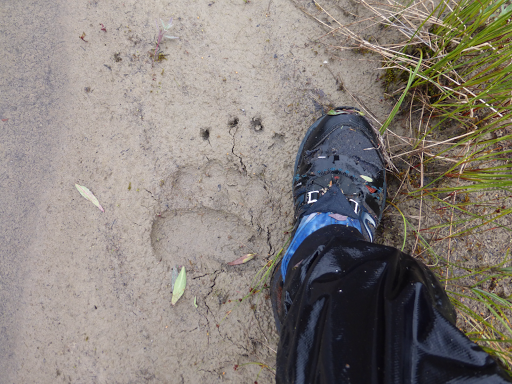 That was not noted by previous hikers, so maybe that will help others who do it in the future. We were thankful to get that for awhile, but also lost it on and off. 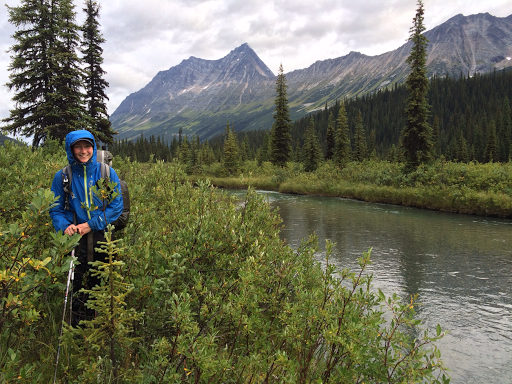 We stopped for lunch after Spider Creek and the sun still hadn’t made much of an appearance. Our tents and sleeping bags were pretty wet, so we found a spot along the river and yardsaled what we could hoping the breeze would dry it partially. We did get some filtered sunlight through thin clouds and that was perfect timing just to get things dry enough. It really hasn’t been very relaxing at our lunches when we spend the whole time unpacking all our things to dry and then rotating them from one side to another before packing them up again. Definitely a drawback on this trail that is just wet a lot and has lots of condensation at night. The excitement after lunch was that we finished up the Jackpine River “fun” and had a forested section where the trail is apparently nonexistent due to deadfall. Temperatures got to 60F/15.6C and we actually hiked without our rain jackets. 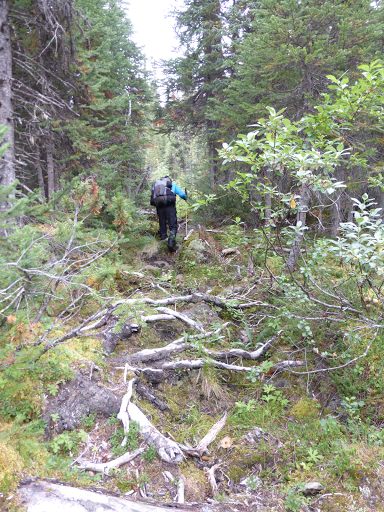 As for the trail, as expected, we lost the trail quickly under all the deadfall and brush. It was over an hour of straight cross country until we reached the next landmark of Meadowland Creek. There is a GPS track from the GDTA, but many times, it is well off and not to be used step for step. It generally heads in the right direction, but seems to have been drawn in sometimes rather than created from someone on the ground. The notes we have say that if you lose the trail, just get to the creek and it will be easy to pick it up from there. Um, not the case for us. 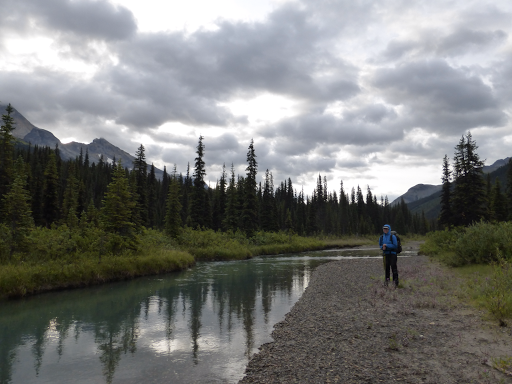 There were dense woods and brush along both sides of the creek and we explored up and down it for a bit before deciding to stop for the night. 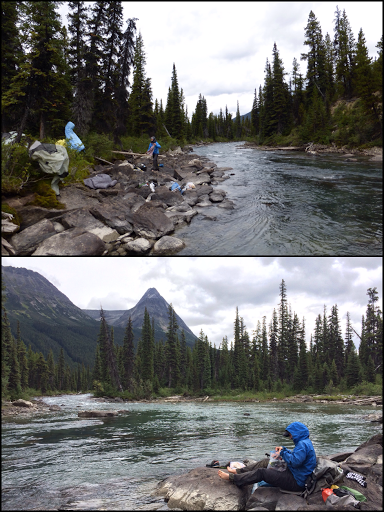 It was 7pm by the time we stopped and the only place to setup was right on a rocky sandbar along the creek. It’s actually been a nice spot, but it’s raining lightly now on the tents and that means more fun in wet brush in the morning again! The good thing is that E has a very positive and humorous outlook in these sections and that really does make it almost fun. It just seems that if you were out here going through this alone, it would be pretty tough mentally. It’s been great to have one another to keep things light and we find that even with days or moments like today, we still love this trail. We feel fortunate because it seriously could rain or snow all day out here and we’ve been very fortunate most of the trip that it’s been a relatively dry year. Tomorrow, we’ve decided to just cross country uphill into the dense brush and woods toward the next landmark until we cross trail. I just hope it isn’t too cold and wet. I’m shivering just thinking about it. So happy and warm in my sleeping bag for the night.